I thought it might be helpful for others, because I struggled with finding the right combo. I wanted to fit 35's with minimal lift. This is what worked for me with no rubbing, cutting, trimming, etc. I wasn't sure what it would do to my ride but turns out the ride is as good if not better than the stock setup I had. I have about 2000 Miles on the tires now. Very quite. No louder than the Michelins that were on it. Hope this and the photo helps. I'll try and upload more later. Last edited by GlobalPilot; 09-04-2017 at 03:12 AM. Perhaps it's the photo, but front looks higher than rear? Abita - I think you're right. Though the photo may make it look higher than it actually is. It's ever so close when I measure. I think the front could possibly settle a tad more. I'm going to wait a little longer and go from there. That's exactly what I want mine to look like. Awesome job. Which front level kit did you go with? I went with ProComp. Though I feel like there are lots of good options for spacer setups. Love to see it when your done. I wonder how one would look with the 2" level and 4" in the rear?? I haul a travel trailer and a quad so i know the rear will drop. I think it'd look really good. Pretty sure they would clear but it would be close I think. I've got an F-350 SRW that already has the 4" block on the rear. I was considering getting a leveling kit for the front until I read that the taller rake on the back was intentional. It was engineered this way so that when a load is put on the back, the vehicle levels out. Without the rake, when you put weight in the back, the front is higher than the rear. This can also cause problems with steering stability when weight is taken off the front of the vehicle. Since I use my vehicle for towing and hard manual labor, I decided against the leveling kit. 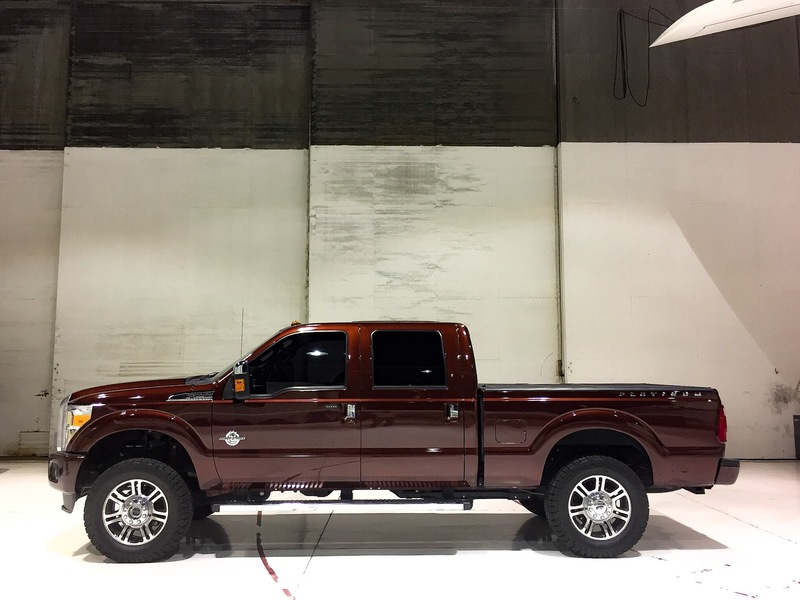 Sure, it looks better leveled while just tooling around the city, but that's not why I bought a Super Duty truck. Braggs...I know what you mean. Though with my F250 even when I pulled a trailer or loaded the bed before my level the rear sat lower than the front end. My goal was really to put larger tires on and give me a little more clearance without going to a full blown lift. I'm off road a lot so this seems to work so far. I think though that eventually I might go with 4.5" blocks to give me a little rake like you mention. Then I'll have the best of both worlds. I've leveled all of my trucks...Never had any steering issues of any kind. Not that it couldn't be an issue. But so far they've worked great for me. As long as the tire ratings are the same, the OP's leveled truck will have nearly the exact same towing characteristics as it did from the factory, as would yours. ...since I use my vehicle for towing and as little manual labor as I can get by with.